Have a lot of juicy plums that need a place to go? 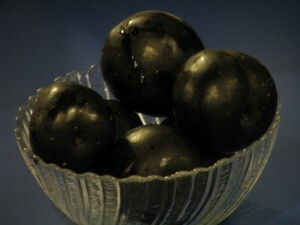 Eating fresh plums in the sunshine with the juice dripping down your chin is like sipping nectar in paradise. 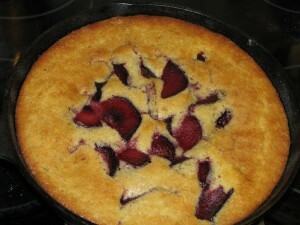 How about this tasty, light cake baked in a skillet? A cast-iron skillet is perfect for this cake, but you can use any oven-proof skillet or baking dish if you don’t have one. If you are skilled in campfire or Dutch-oven cooking, take this recipe with you when you camp. As an interesting change of seasonings, use the Chinese Five-Spice powder that has been hanging out in your spice pantry since the last time you made stir-fry. If you don’t have any, use freshly-grated nutmeg or ground cinnamon. 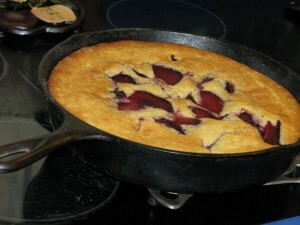 Dessert in a cast-iron skillet can be cooked over a campfire instead of your oven. No cast iron? Use an oven-proof skillet or baking dish. You can use other stone fruit instead of plums with just as good a result. Butter a 10-inch cast-iron skillet (or ovenproof skillet or dish). In a small bowl, whisk together flour, baking powder, baking soda, Chinese Five-Spice powder and salt. In large bowl, or in a mixer bowl, combine 1¼ cups sugar and butter until creamy. Add a third of the flour mixture with a third of the buttermilk, until all is combined. Don't overbeat. Pour batter into prepared skillet and smooth top. 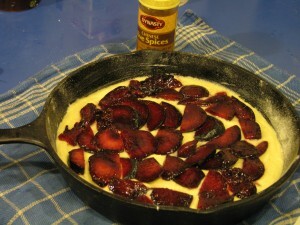 Spread sliced and halved plums all over the top. Bake 35 minutes until golden brown and a toothpick inserted into the center comes out cleanly. Cool for about ten minutes before cutting. This entry was posted in Cake, Fruit, Recipes, Vegetarian and tagged Dessert, Recipes. Bookmark the permalink.